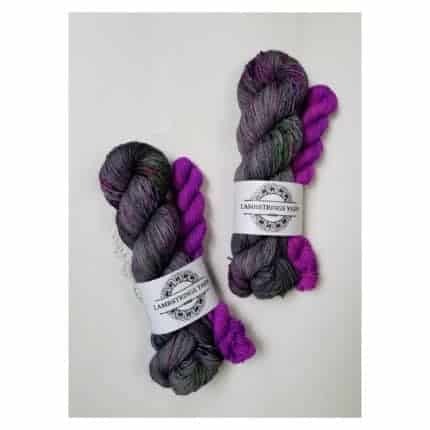 We’ve been getting a lot of inquiries and requests for sport and worsted weight yarns: Will they be back? Will we do a custom order? The answer has always been yes, but I’ve decided to make it 100% easier for you to order these bases without the hassle of the email tag game! 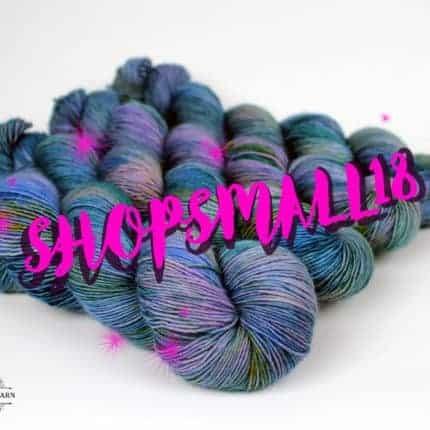 We’ve added a “Dyed to Order” section to the shop for Tralala Sport and Ewetopia Worsted bases so you can get exactly what you want right away. 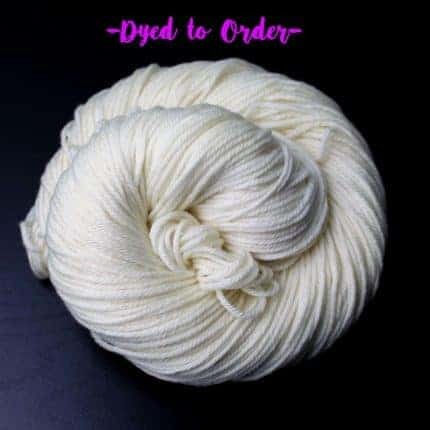 All you have to do is visit the shop and locate the main menu at the top of the screen (desktop) or the side bar (on your mobile device), click on “shop by” and select “dyed to order” (current processing times will be listed). Then you can choose your base and quantity to add to your cart. *Don’t forget to specify which colors you’d like to order in the “Special instructions for seller” box located in your shopping cart. It’s finally fast and easy!!! 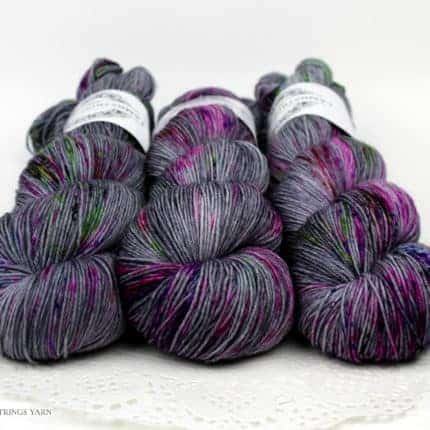 We’ve also restocked the shop with some ready to ship skeins including Party Monster, Relax, It’s Just Magic, Little Miss Macabre and Annabel Lee. 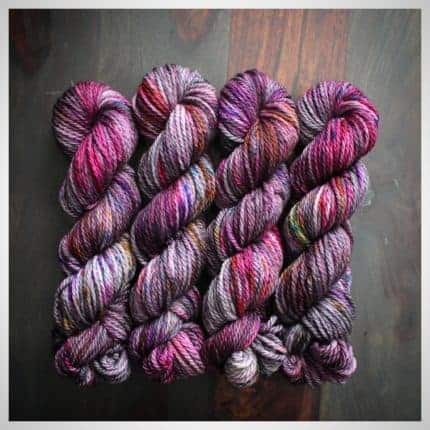 Look for these colorways on Sadie Singles, Tralala Sock and Ewetopia DK. 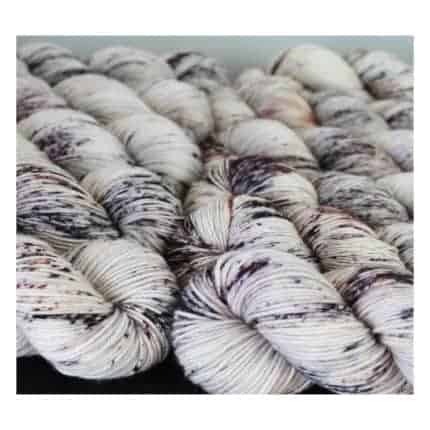 Ewetopia Bulky is a super soft 3ply Superwash Merino wool with 106 yards (97 meters), perfect for hats, mitts, and chunky cowls. And did I mention that it will work up super speedy? 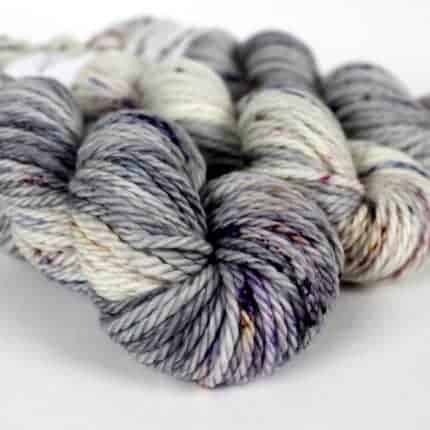 Yup, if you’re looking for a fast project yarn, this is it! New beginnings: shop update today! I hope everyone is having a happy and healthy start to the new year! Now is the time for new beginnings, hope and renewal, the start of the year, wouldn’t you agree? Birch is our newest colorway symbolizing just that. Birch has been used as a symbol of new beginnings (and more) in many cultures as it is the first tree to bloom in the spring. The bark is also said to have magical properties. I wanted to bring the idea of a new beginning into the new year instead of making a resolution this year. Thinking of change as a positive experience has always been a challenge for me, but moving to a new city for the first time has forced me to reevaluate my thought process on the matter and embrace a new beginning. Birch is a very light feathery grey, speckled with black, browns, and greys, inspired by the bark of the birch tree. 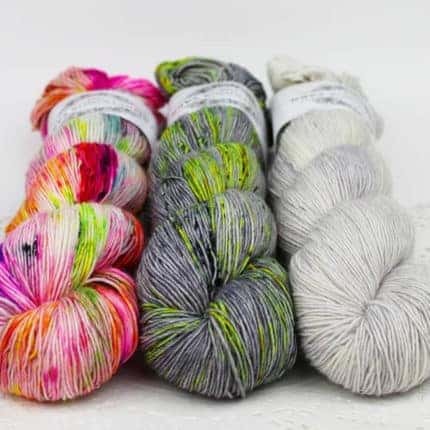 Birch is now available on our ready-to-ship bases: Sadie Singles, Tralala Sock, and Ewetopia DK. Larger sweater quantities on these bases and worsted are available upon request. Cyber Monday 10% off sale! Hi everyone and happy cyber Monday! 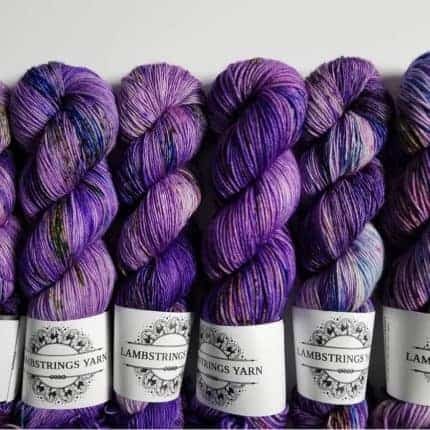 Today is the last day (11/26) to save 10% off your entire order at LambstringsYarn.com! Just use coupon code SHOPSMALL18 at checkout to receive your discount. 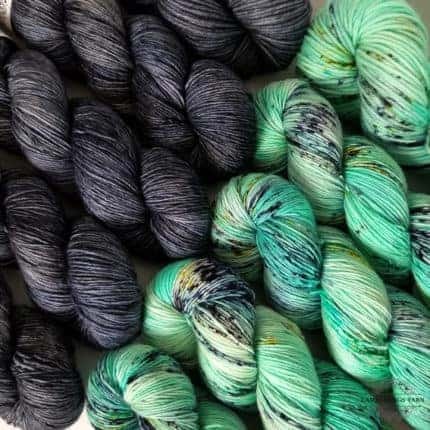 There is no minimum purchase, EVERYTHING is included 🙂 yes, even our brand new colorways – OOAK Dreamscape (pictured above) and The Black Shuck (my new favorite). The shop has been completely updated with sweater quantities on all of your favorite bases. But just in case we don’t have the quantity that you’re looking for, we can always create a custom listing especially for you. This coupon code expires 11/26 at 11:59 ET. Hope to see you in the shop, and happy shopping! Holiday Sock Club Pre-orders are here!!! 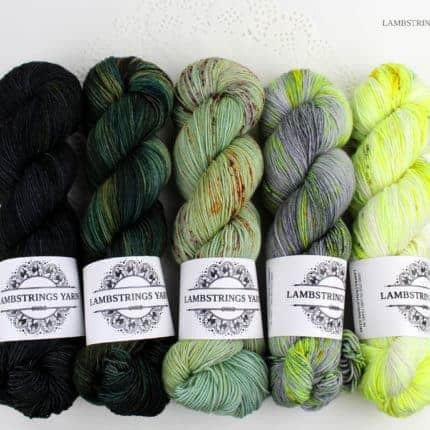 Lambstrings Yarn is doing a holiday sock club! Yup yup yup! 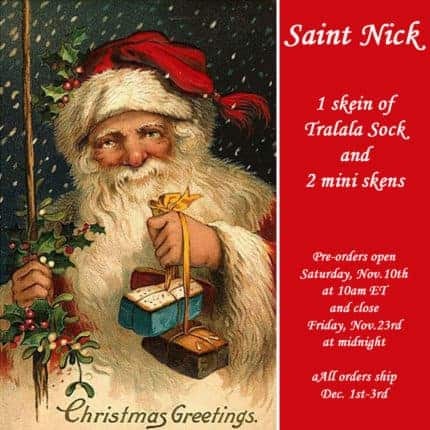 I’m so excited to bring you not one, but TWO holiday inspired sock sets to choose from, Krampus and Saint Nick! If you know me and my color style, you know these won’t be your typical traditional holiday colorways. They will be unique and moody as always! These will be mystery sets, only to be revealed upon they’re arrival to you (photo inspiration provided above). 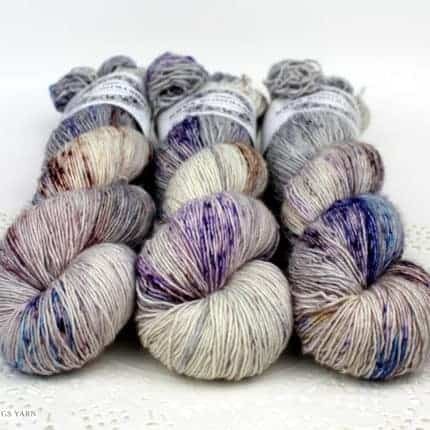 Each set will come with one full skein of Tralala Sock (75/25 SW Merino, nylon, 463 yds) and two Tralala Sock mini skeins (92 yds) in contrasting heel/toe/cuff colorways. 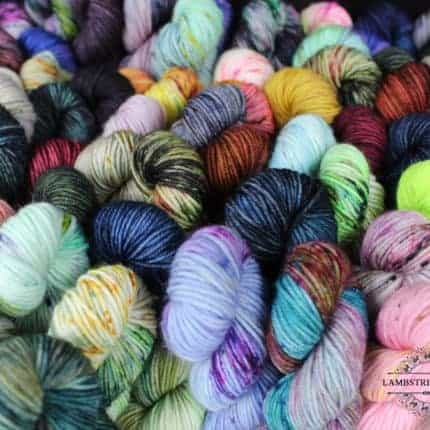 You can find our sock club at LambstringsYarn.com at the top of the page under menu, shop by, Holiday Sock Club. 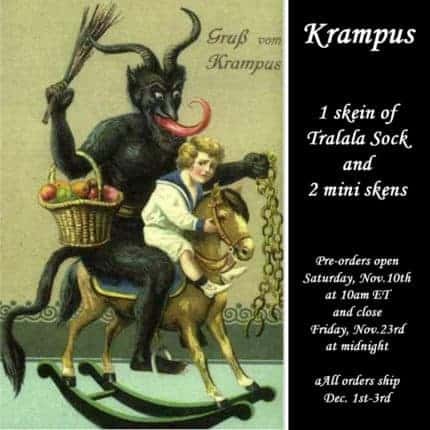 They will be listed separately as “Krampus” and “Saint Nick,” so they will need to be added to your cart as such. Pre-orders will open on Saturday, Nov. 10th at 10 a.m. ET and close Friday, Nov. 23rd at midnight ET. All orders will ship Dec. 1st-3rd. Hi everyone, and HAPPY SUMMER! The hot weather is finally here, and you know what that means… it’s time to start your summer projects! For me, a summer project means something lightweight, small and portable. Definitely something you can take to the park or on a long car trip to the beach, maybe even something you can work on while your catching some rays. Well, we’ve got you covered. Can we say SOCKS!! 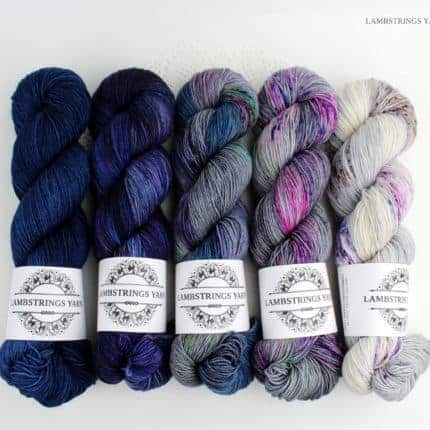 YES, sock kits are returning to Lambstrings Yarn. 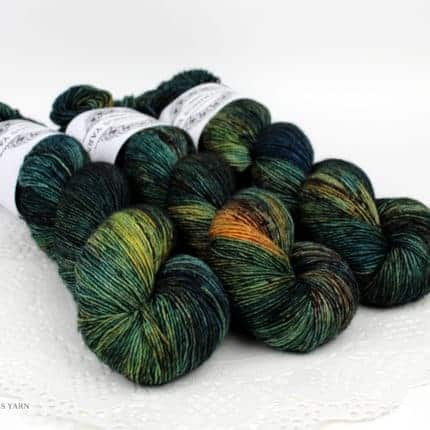 You’ll get one full skein and one mini skein of Tralala Sock (75/25 Superwash Merino/nylon) in contrasting colors for heel/ toe/cuff contrast, enough yardage to make a large pair of adult socks and some to spare. 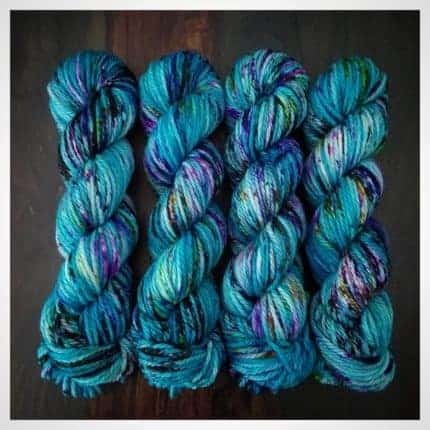 We’ve put together some really fun tropical summer-y inspired kits to help get you into your vacation mood, as well as some neutrals that will calm and relax. These will be uploaded to the shop on Friday night, June 22nd at 7 p.m. Eastern, so I hope you can grab one then! Happy Saturday, everyone! We are so excited to have beautiful sunny weather here in NY after days and days of gloomy rain, so what better way to celebrate this gorgeous holiday weekend than with a GIANT shop update? 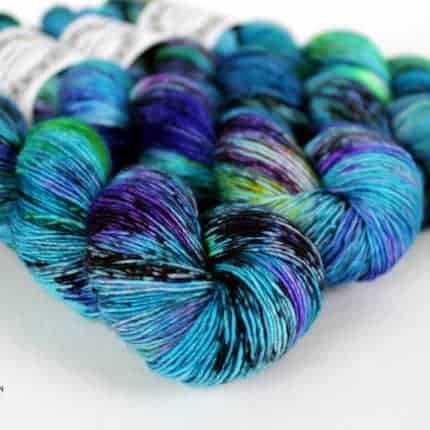 Lots of your favorite bases and colors have been added to the shop this morning including our new Sadie Singles base, a 100% SW Merino single ply. Speaking of sweaters, there are plenty sweater quantities on tons of bases available and ready to ship! I hope you can check it out today! 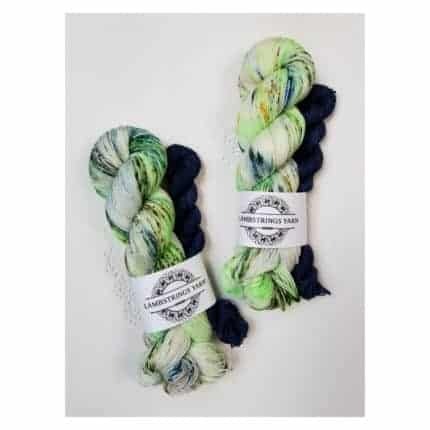 Fading Point Kits are back in stock at Lambstrings Yarn! The shop update will be Saturday April 28th at 10 a.m. EST, so set your alarms because these beauties are going to go fast! Three different fade styles are available and ready to ship on our Tralala Sock base (75/25 SW Merino/nylon- 463 yds). 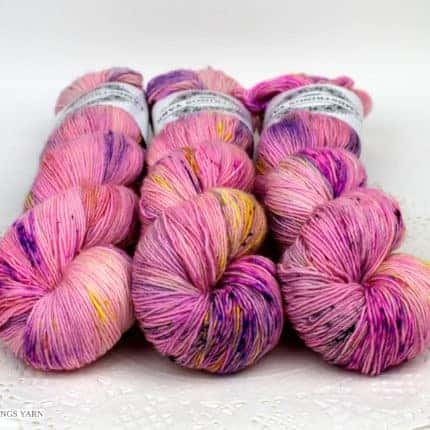 Of course, this five-skein fade can be used for a variety of different projects, so if you’re not knitting the Fading Point, do not despair! 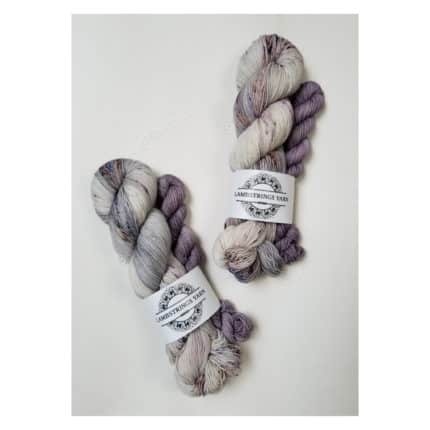 These kits can be used for any fade project utilizing this base/weight/yardage. 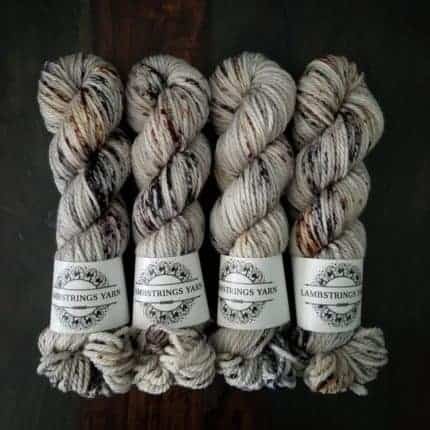 You can find these kits at LambstringsYarn.com under the Fade Kit section. Round 2 is upon us! 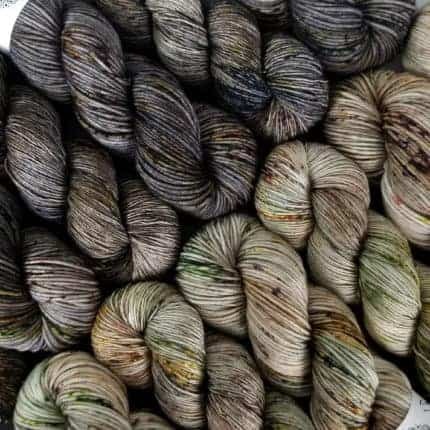 Our first Fading Point kit update was a success and we’ve had several requests since then. We are working hard to bring you more Fading Point kits very soon. This week is all about dyeing up our most requested color combos for Joji’s new beautiful design. 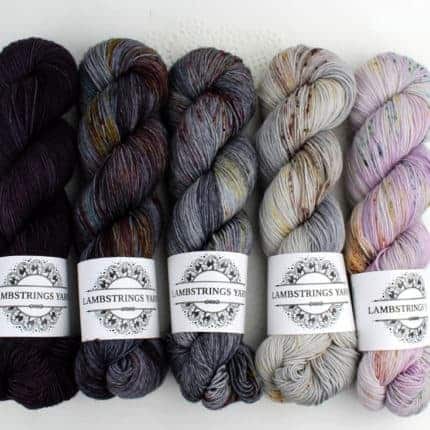 All kits will include five skeins of Lambstrings Yarn Tralala Sock (75/25 SW Merino and nylon, 463 yds) in a cohesive and unique fade, ready to ship. You can find them in our Fade Kit section of the shop. 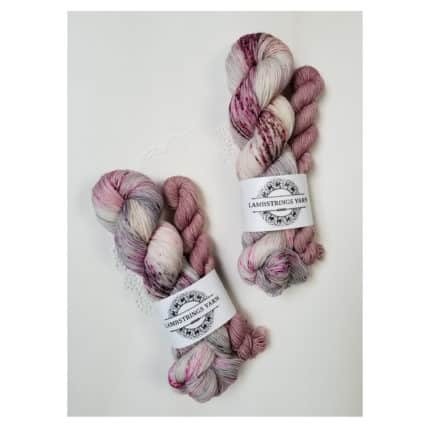 If you’re interested in building your own kit for this project, you can just visit the website and choose five skeins that speak to you, or contact me to discuss what might work best for you and we can build a kit together. All colorways used for kits are repeatable! Yup, every single one. So if you see a color you like on its own, You can find it in our Sock section of the site. Stay tuned for update dates and times coming soon!